Just the other day I was sitting around with my husband musing about the state of post-baby Beyonce. We haven’t really heard much from the pop star over the last few months, but luckily for fans, she seems to be doing just great, and doting on her now 11-month-old baby Blue Ivy Carter. Motherhood becomes some women, and Beyonce is certainly one of those women. Back in January, Beyonce and her husband, rapper and producer Jay-Z, birthed their first child, a baby girl they opted to name Blue Ivy. The couple later attempted to even trademark that name, but that’s another story entirely. Since the birth of her first baby, the 31-year-old pop star has mostly stayed out of the spotlight, taking care of the little tyke, although she has occasionally done an interview or posted to her Tumblr account. Now, however, she’s posted a few new baby-oriented pictures to her personal website to celebrate family around the Thanksgiving holiday. 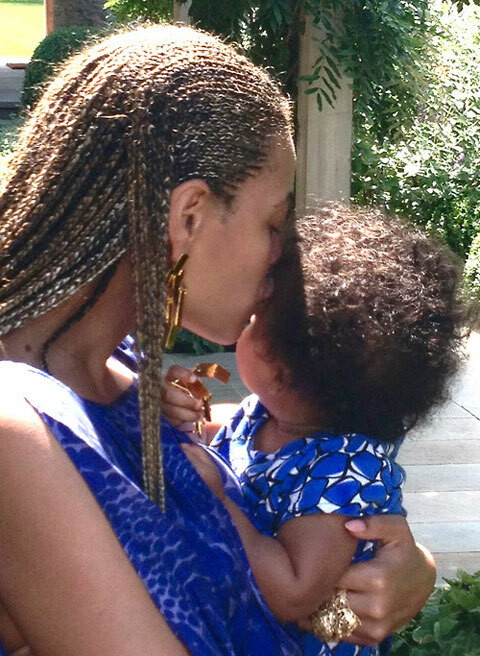 The most spectacular of the photos shows Beyonce and Blue Ivy in—what else?—visions of blue. The star also posted a sweet note to her fans which reads, “From my family to yours. Wishing you a happy and healthy Thanksgiving.” It’s a nice gesture for a holiday weekend, and it also gives us a new peek at Blue Ivy’s full head of hair! Hopefully, this is the first of more cute family photos to come.